Sometimes I wonder if I live in a parallel universe, separated from the realities of my friends and peer group and most people's normal experiences. In the present world of alternative facts and intellectual echo chambers, where the social and cultural divide between, say, hip liberal world citizens in inner-city New York and traditionalist Midwest sports fan in a way is larger than perhaps ever, these kinds of experiences are to be expected. But they never cease to amaze me. Deirdre: "But, Jack, you delight in searching for antiques in markets...?" Jack: "I don't care. I hate markets!" Before going into more intense polemics, and describe my initial remarks to reading these paragraphs, let me discuss this is context of what Jonathan Haidt and Sam Harris have recently taught me. I understand that there are differences in values. I understand that, for whatever reason, some people feel or reason or have genes that nudge them into certain convictions: we must help the poor, respect your parents, love/fear God, protect ourselves against foreign terrorists, promote LGBTQIA rights, protect property, redistribute income to more deserving people etc. I understand that some people are extraordinarily sensitive to suffering and harm to others, in whatever form it comes. I understand that reasonable people disagree in judgement, disagree in preferences, disagree in goals and disagree in most appropriate ways of reaching those goals. But I don't understand how reasonable people can look at our amazing vibrant market societies, ultimately a product of love and desire to improve each other's position, and say: that's terrible! That's oppressive, that's offensive, harmful, deceptive, unsatisfying and should be better left to some bureaucrat trying to achieve some imagined and unobtainable noble outcome. Entrepreneurs compete to better please consumers, i.e. improve our lives. Human actions displayed and conveyed to the rest of us through market prices are the Ultimate Outcome of that. Hyperbolic and exaggerated language aside, what I don't understand is how smart, well-educated people can look at the same world I see, and see something so completely different. Where I see spontaneous order, they see designed deception; where I see business satisfying our needs/wants yet better, cheaper, easier and faster than yesterday, they see exploitation or extraction of surplus value; where I see individuals enriching us all through their efforts and entrepreneurship, they see privilege undermining the little guy, wealth created at the backs of the poor in a zero-sum world. And more importantly, where I see a world improving more rapidly than has ever been the case, they see a world in chaos, despair and unfathomable crisis. How do we square that? What are you even talking about? We repeatedly buy things in the same places, we come back to the same cafés and restaurant because the staff (looking to make money off us, by the way) treat us extraordinarily nice and sell us splendid food; both parties say "thank you" when we've finished a transaction, and not only from politeness; we buy cheaper books off Amazon, again and again, whose costumer service never cease to amaze us; we return to the same barbers and manicure saloons and tattoo artists because they do splendid job in enriching our lives; we complain loudly when some product or service is below our expectations, and are most commonly compensated/having the good replaced. What does Weeks even mean when he says that buying and selling frustrates us? Compared to any society in any time period past, the objection it raises is, if even true, both lame and nonsensical: we've never had this easy access to so many resources, amazing products and services, of such high quality, so effortlessly. 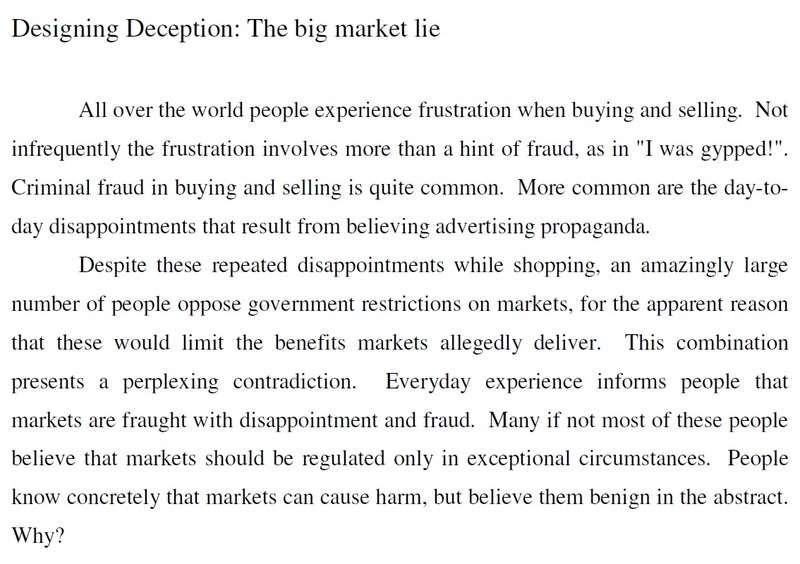 Should we, against all reason, be repeatedly “disappointed while shopping” that seems to me to be an indication of historically extremely high expectations (probably created by the constant improvement in quality and quantity capitalism has delivered) rather than an indication that markets are bad forms of human organisation. Even if it would be true that you, me, Weeks or some random person off the street repeatedly “experience frustration” while shopping, it does not follow that others, or even a large majority shares that experience, or – more devastatingly for Weeks’ case – that we would wish that opportunity away, should we have a choice to. Besides, we keep shopping, which at some basic level indicates that we yet again expect to be satisfied by the good or service. For Weeks’ case to hold, we must be the most naïve breed of humans imaginable, continually deceived and unable to change neither behaviour nor expectations. In other words, we are collectively worse than the most immature child. Does that hold? From these kinds of argument it neither follows that “The Alternative” of regulating market in any way would improve this allegedly unsatisfied outcome. We have countless examples of failing, corrupt, inapt and inefficient government actions allegedly introduced as a force for good, but carried such unintended consequences that the outcomes were positively evil. most everything he says is incorrect, from the depiction of ‘neoclassical’ economics to the origin of macro starting with Keynes (see Colander's review here). Or how about this: “Understanding the economy of any society is not simple, but no more difficult than understanding the political system sufficiently to vote.” (p. xiii); to mention one major difference, any political system has about three variables: how do you cast your vote, how is the winner determined, and what power can that winner exercise. Three variables are what the economic system runs through way before breakfast; they are clearly not analogous. Weeks can cherry-pick and strawman economics all he wants, but it doesn’t mean that his conclusions are sound. His writings are one long and tiresome objection to the “dominant economics”, the “media they control” and the ideological presupposition underlying it. If you had no other knowledge of the world than what Weeks brings to you, you’d suppose that we live in some kind of free-market utopia where governments play minor-to-no role in economic and social life, that all prominent economists agree on that constitution, and that all laymen accept their ignorance and let economists rule the show. Except that, again, none of it holds up: governments tax and spend upwards of half of our economies (eagerly applauded by many, if not most, economists); governments micro-regulate most transactions or social relations they deem good enough to be legal (see vast amount of regulations), and with the use of violence ban those they dislike; governments picks losers and runs corporations, despite very little rationale in the economics literature; governments “provide” (read: crowd out) services way beyond the economic textbook examples of public goods and externalities. In other words, Weeks’ description of the world as one dominated by an ideologically-driven and narrow-minded class of economists, praising free markets as the best way of organising human society is not only wrong, but so emphatically wrong that any observer lifting his gaze from Marx’s or Keynes’ ancient writings would know better. This is my crucial point: how can anyone – perhaps especially high-educated and presumably analytically sharp people – look at the world with all the richness of data and knowledge that we have, and profess so many statements, most clearly incorrect? 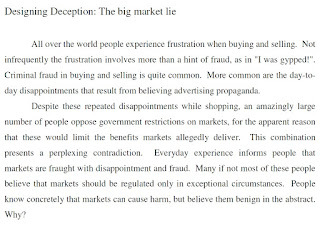 I'm just very curious as to what people see when they reach conclusions like "markets are unsatisfying" or fraudulent. What, specifically, in the big world out there, are you seeing that makes you believe that? What makes you ignore all the splendid market transactions that clearly enrich your world, á la McCloskey's friend Jack? 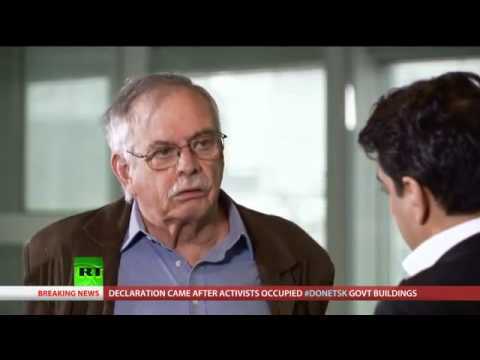 And what makes you think that those isolated fraudulent examples are representative for the system as a whole (Marx's Superstructure and conspiracy theories aside)? I guess I'll find out at Glasgow Economic Forum 2017!